I knew I had to make these cookies. I pinned them a week or so ago and couldn't wait to try them out. 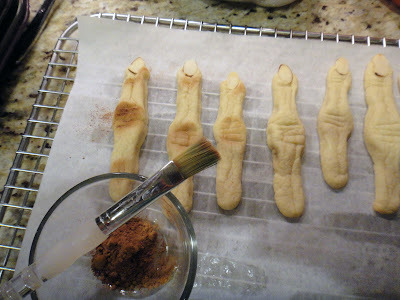 Friday was a big baking night, so I worked them in with the other sugar cookies for Halloween. 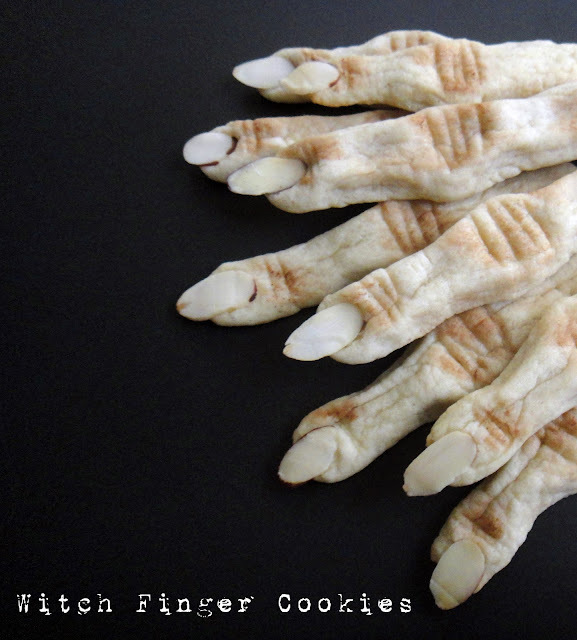 My Sugar Cookie recipe is here. 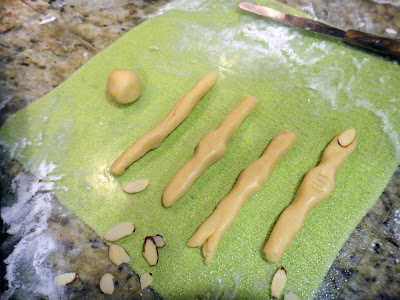 The photo above demonstrates the progression of making these creepy finger cookies: roll dough into a ball, roll out like a snake, gently pinch the dough to the center for the knuckle, press the rolled finger to slightly flatten, score 3 or 4 lines on the knuckle, press an almond slice for the finger nail and make two small scores below the fingernail. If you need help, look at your own fingers. Hopefully, your fingers are not as arthritic as those below! Lightly dust the knuckles with cocoa powder. Don't overload the brush (see the cookie on the far left). 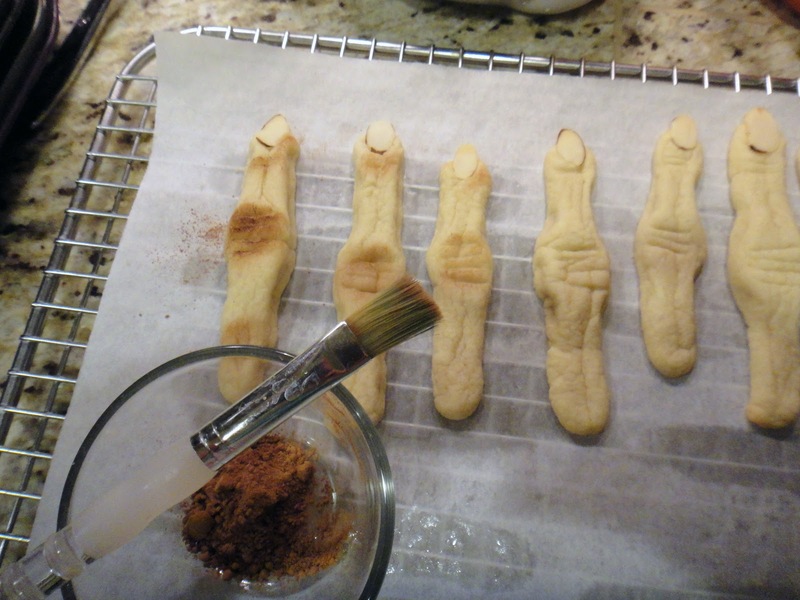 Depending on your dough, the fingers will spread and puff while baking. You may want to bake one or two different sizes to see how the whole batch will bake. I removed my cookies a little early and patted the sides just a little to reshape. I like how it gave the cookies a more aged look. Little fingers will be a bit hesitant to grab one of these witch fingers at first. If you want to creep it up, drip some red icing for a bloody look. 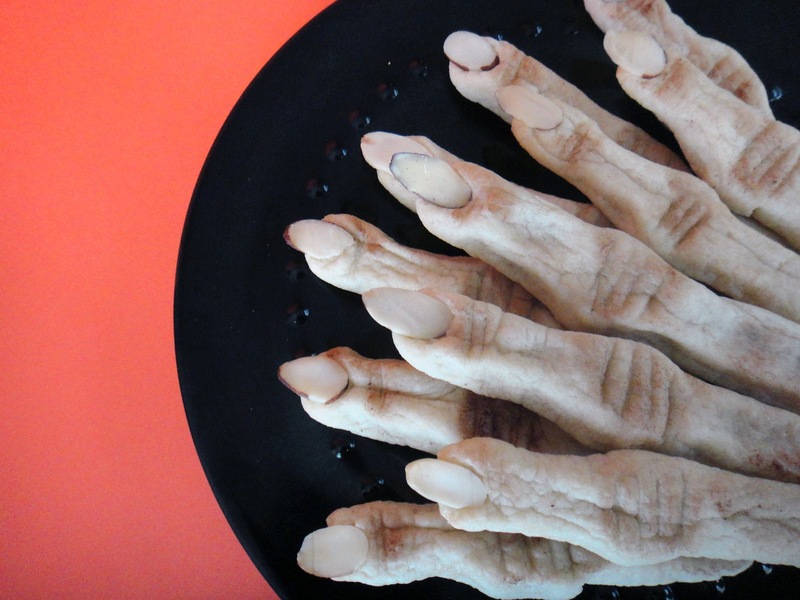 For more Halloween projects and spooky treats, click here. SOOOOOO creepy! Great job! loved stopping by:) Thanks for linking up To Whimsy Wednesday! Oh my goodness, they look so real! Thank you for the idea. I'm visiting from Whimsy Wednesday, I'd love to have you visit me too! 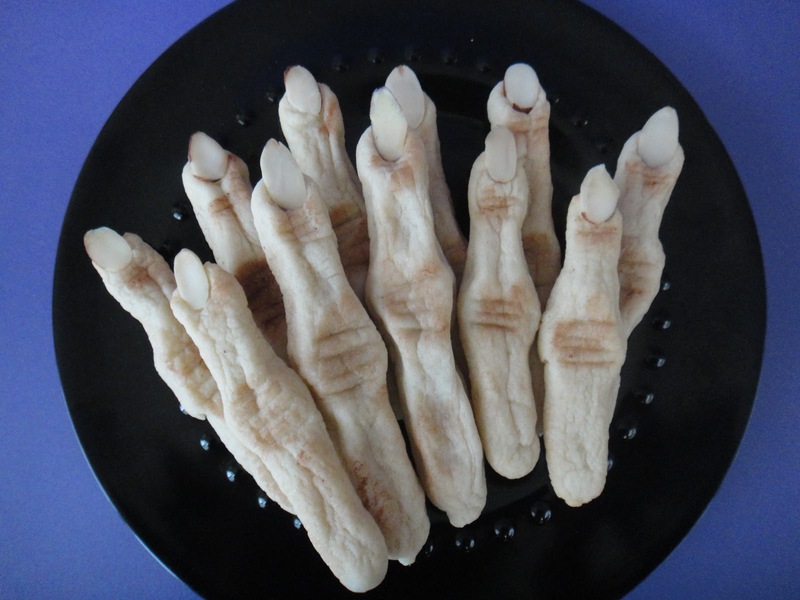 These are one of my favorite Halloween treats I've seen this season. 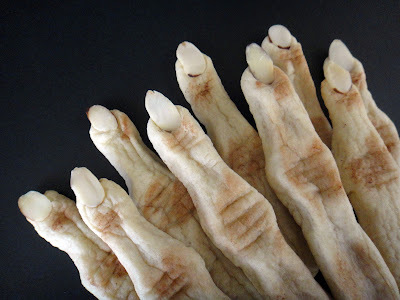 Awesomely ghoulish! Scary!! Great detail! Thanks for sharing at Keep Calm and Link Up! Those are fantastic! I made some a few years ago that didn't look nearly as creepy! The cocoa powder is genius!